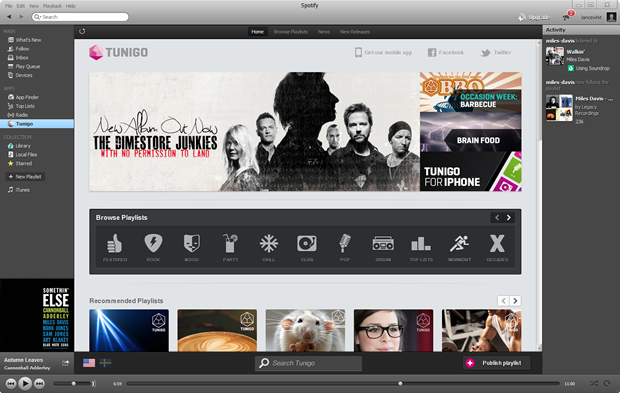 Spotify has picked up Tunigo, a Swedish company that offers its own music discovery app. Tunigo's app tries to help people discover music by offering playlists picked by its own editorial staff mixed in with songs from its own users. The app is available on Spotify itself and viaApple's App Store. A private beta is also available for Android users. Tunigo has been a long-time partner of Spotify, and its app has been in the top 10 list of all Spotify apps since the streaming music site opened for business. "The acquisition fits into our overall strategy around music discovery...basically helping our users make sense of over 20 million tracks," a Spotify spokesman told CNET on Friday. "Their app will remain on Spotify and their team will be moving to the Spotify offices in Stockholm and New York." Though the Tunigo app will stick around, the new team members will likely work on Spotify's main servce, according to AllThingsD. Spotify currently has 24 million users and 6 million paying subscribers.